Lhasa, Tibet -- Probing fingers brushed my hip as I plunged into the crowd of Tibetan pilgrims shuffling around and around the Jokhang Temple. I turned, ready to confront a pickpocket, but instead found a tiny, elderly Tibetan woman fumbling to hold my hand, like a teenager on a first date. If a smile is an expression of warmth and joy, rather than merely a display of dental work, the three-tooth smile she flashed me was one of the most beautiful I've ever seen. Hand in hand we promenaded through the teeming streets of the Barkhor, the old Tibetan quarter of Lhasa, pausing to inspect the prayer wheels for sale and share a laugh with a burgundy-robed monk. If the woman had any agenda other than to enjoy a stroll in the morning sunshine with a new friend, I never discovered it. This was my introduction to Lhasa, and it was not what I was prepared for. I had arrived in the Tibetan capital with the lowest of expectations and a stomach-souring sense of dread. "The Chinese have absolutely ruined the place," said friends who'd been here in the mid-1980s, when it first opened to Westerners. "It doesn't even feel like Tibet anymore." They have a point. A sprawling, modern Chinese city has overrun old Lhasa, with garish neon signs, strip-mall karaoke parlors and, I'm told, a thriving red light district. And the Chinese can't be blamed for all the blight: Near the magnificent Potala Palace, I saw an enormous billboard for the top-selling brand of beer in Lhasa: Budweiser. The Chinese, who conquered Tibet in 1950, say they're bringing much-needed economic development to one of the most impoverished corners of Central Asia. They also claim that 87 percent of Lhasa's residents are Tibetan, which, frankly, is hard to believe. For decades, the government has been offering strong incentives for Han Chinese to immigrate to Tibet, and the railway that opened last year from Beijing to Lhasa is speeding the population transfer - as well as bringing in Chinese tourists by the thousands. All this is true. Yet I was delightfully surprised to find the old Tibetan heart of the town, the Barkhor, still beating strongly. On that first morning, when I'd asked the desk clerk at my hotel how to get to the Barkhor, he gestured out the window and said, "Just follow the prayer wheels." Outside the door an elderly, walnut-faced Tibetan woman in a blue silk robe was ambling past, a cowboy hat atop her braided hair. She was holding a small bejeweled cylinder on a short stick - a prayer wheel - and she was making it spin with a subtle roll of her wrist. With her other hand she fingered a string of prayer beads. I followed her down the sidewalk, close enough to hear her murmuring om mani padme hum, the traditional Tibetan mantra, over and over. At the first intersection we joined half a dozen other Tibetan men and women with spinning prayer wheels, all headed in the same direction. As we marched past modern Chinese shops and office buildings, the trickle of Tibetans became a stream, then a river, then a flood, all converging on the Barkhor. At the entrance, the faithful were tossing juniper cuttings into an enormous, kiva-like incense burner, and pungent clouds billowed out of the chimney. A nearby pole was wrapped in prayer flags, and a succession of pilgrims stepped up and reverently pressed their foreheads to it. The Barkhor is a warren of medieval streets and alleyways that forms a kora - a circumnavigation - of the Jokhang, the holiest temple in Tibet. It normally takes at least half an hour to make a circuit, always clockwise, but some pilgrims were doing their koras as a series of prostrations, sprawling flat out on the ground, circling the temple one body length at a time. The streets are lined with whitewashed old buildings with colorful fringes above the windows, and the streets were crowded with pilgrims from the far corners of Tibet - yak herders in mukluks and heavy robes, dashing young Khampa warriors with red ribbons in their hair, prosperous families from Amdo dressed to impress in neon-colored silk. Watching them circling the Jokhang again and again and again, murmuring the same mantra over and over and over, and popping into little chapels to spin giant prayer wheels around and around and around, their behavior, frankly, begins to look a little obsessive-compulsive. They believe it earns merit toward a better life next time around, but beyond that I can't claim to understand it. Still, it's hard to argue with the results. Despite all they've been through, most Tibetans I've met have an inner peace and joy that we in the West never seem to be able to attain, no matter how many plasma-screen TVs we buy. The Barkhor is also the main Tibetan shopping district, and it's lined with stands selling prayer flags, prayer beads and prayer wheels, yak bells, jewelry of silver and turquoise, silk robes and even yak butter for temple offerings. After a couple of circuits I sat down on a curb to watch the passing parade, and was soon surrounded by a crowd of curious Tibetans. To entertain them I played show-and-tell with the photos in my Lonely Planet guide: the Potala Palace, Mount Kailash, the Tashilhunpo Monastery, Nam-Tso Lake. There was one photo in particular they yearned to see, but it wasn't in the book. The Chinese strictly forbid images of the Dalai Lama, Tibet's exiled leader; any book containing one would be confiscated at customs. As I flipped through the pages, though, a woman with chunky turquoise jewelry in her braided hair suddenly stopped me and gently took the book from my hands. Her eyes grew wide and misty as she stared at a page with nothing on it but text. It was the book's preface, and she recognized the signature at the bottom: the Dalai Lama's. The woman bowed and touched her forehead to the page, and when she handed it back a tear was rolling down her leathery cheek. Then she looked around to make sure she wasn't being watched. There's a Chinese police post every few hundred yards in the Barkhor, and surveillance cameras mounted on the rooftops. Beijing has lightened up somewhat on its suppression of Buddhism, but it goes to great lengths to prohibit veneration of the Dalai Lama - sometimes ludicrous lengths. Recently it raised eyebrows around the world by issuing an edict forbidding deceased Tibetan monks from reincarnating themselves without government permission. And in 1987, Chinese police roughed up a British tourist because they thought she had a picture of the Dalai Lama on her T-shirt. Actually, it was a picture of the old Phil Silvers TV character, Sgt. Bilko. Outside the entrance to the Jokhang Temple, Tibetans perform prostrations ceaselessly, tirelessly, all day long, polishing the paving stones to an almost reflective sheen. Inside, I was nearly overwhelmed by the smell of the liquid yak butter that the faithful add by the cupful to the flickering lamps, the aroma of the 1,300-year-old sandalwood carvings and the basso profundo chanting of dozens of monks. When my eyes adjusted to the darkness, I passed chapels festooned with intricate mandalas, hundreds of paintings and statues of Buddhas and bodhisattvas, and scary-looking portraits of protector deities. The ancient-looking art was all the more remarkable because most of it was painted in the last few decades to replace treasures destroyed in China's Cultural Revolution in the 1960s. Eventually I reached Buddha overload and shifted my attention to the wide-eyed Tibetans shuffling through the temple, a crush of humanity pressed so closely together there wasn't room to swing a prayer wheel. For many, this was a once-in-a-lifetime (well, once in this lifetime) pilgrimage to the big city, and their faces were filled with a mix of wonder, awe and devotion. I wish I could say I had the same reaction the next day as I toured the Potala Palace. The palace, which fills an entire hilltop, is one of the true wonders of the world, and to set eyes on it for the first time is a watershed moment in the life of any traveler, me included. It is said that architect Frank Lloyd Wright kept only one picture in his office of a building he didn't design: the Potala. And yet the interior, once the seat of the Tibetan government and winter home of the Dalai Lama, was depressingly sterile. It's now a lifeless museum, its many chapels, meditation chambers and assembly halls silent but for the chatter of tourists. The Potala, it turns out, is much better to appreciate from the outside. On my last morning in Lhasa I rose long before dawn, which is much easier than it sounds. Because Lhasa, like all of China, is on Beijing time, it didn't get light until 7:30 a.m. On a tip from a friend, I made my way to the base of Chokpo Ri, a conical hill not far from the Potala. Navigation through the darkened streets was easy: I just followed the spinning prayer wheels. They led me down an alley next to a rental car lot until I could hear the sound of scraping, almost like sandpaper. It was the sound of dozens of Tibetans prostrating themselves at an ad hoc, open-air temple, illuminated only by flickering yak-butter lamps. They were facing a 50-foot-high rock wall on which was painted, I'd estimate, a thousand pictures of the Buddha, with a big blue one - the medicine Buddha - in the center. All around were fluttering prayer flags and hundreds upon hundreds of mani stones - pieces of slate with prayers carved into them. A young man sitting on a low stone wall moved aside and gestured for me to sit down. For almost an hour, until it grew light, I listened to the murmured prayers and watched the devout bowing to the ground over and over and over. There were no tour groups, no surveillance cameras, no scowling police officers in high-peaked hats. It was just a group of Tibetans being left alone to prostrate and pray as they wished, which is really all they've ever asked of the world. Lhasa stands at about 12,000 feet. Take it easy the first couple of days and drink plenty of water. There are no nonstop flights from San Francisco to Lhasa. Connect through either Beijing or Kathmandu; a flight from the latter offers breathtaking views of the Himalayas. You can also take the new train from Beijing. For details, see "High Train to Tibet," Nov. 5, 2006; available from the archives at sfgate.com/travel. 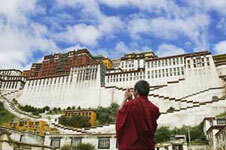 To visit Tibet, you need both a Chinese visa and a Tibet Travel Permit. At present you are only allowed to visit Lhasa as part of a group tour - even if it's only a group of one - and the travel agency organizing it will take care of the paperwork. My group put me up at the Lhasa Namtso Hotel, located on a street for which I could find no name in a modern, ugly neighborhood, a 15-minute walk from the Barkhor, (011) 86-891-630-2388. Used by big tour groups. Lots of upscale touches, but other than the semi-reliable hot water nothing worked very well. Doubles, 880 yuan (about $116 US). If I had a choice, I would have stayed at the Hotel Dhud Gu, Dungu Binguan, (011) 86-891-632-2555, a good mid-range option with a wildly painted lobby and a convenient location not far from the Barkhor. Doubles, about $45. I heard good things about the Kyichu Hotel, 149 East Beijing Road, (011) 86-891-633-1541, www.kyichuhotel.com/contact_us.htm. Doubles, $60. Snowlands Restaurant, Mentsikhang Lam, near Barkhor Square. Good momos and other Tibetan dishes, in a clean and well-run setting. Dinner entrees, 15-30 yuan ($2-$4). China National Tourism Office, (818) 545-7507, www.cnto.org. Tibetan Government in Exile, www.tibet.com.